In the mid-1980s, O’Reilly (aka O’Reilly & Associates) was selling short books on Unix topics via mail order. These books, known as “Nutshell Handbooks,” were held together by staples, and had plain brown covers. Over time, Tim O'Reilly decided that he wanted to sell the books through brick-and-mortar bookstores, and hired a graphic designer to create new book covers. Those covers were used for the first two titles that were sold into bookstores, but Tim wasn’t satisfied with the design. A neighbor of mine worked at O’Reilly as a technical writer and marketer. She showed me the covers they’d had designed, and wondered if I might have a better idea. At that point in my career, I was immersed in the VAX/VMS world of Digital Equipment Corporation as an executive producer of slides and video. I had heard of Unix, but I had a very hazy idea of what it was. I’d never met a Unix programmer or tried to edit a document using vi. Figure 1. 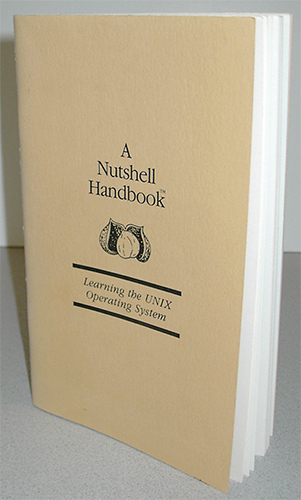 One of the original Nutshell Handbooks. Even the terms associated with Unix—vi, sed and awk, uucp, lex, yacc, curses, to name just a few—were weird. They sounded to me like words that might come out of Dungeons and Dragons, a game that was popular with a geeky (mostly male) subculture. Sometimes when designing, things come together effortlessly—everything falls into place as if it were inevitable. It just flows. As I looked for images for the book covers, I came across some odd-looking animal engravings from the 19th century. They seemed to be a good match for all those strange-sounding UNIX terms, and were esoteric enough that I figured they’d probably appeal to programmers. And, as I investigated the attributes of the real animals, I quickly discovered that there were intriguing correspondences between specific technologies and specific animals. That resonance grew and expanded as I learned more about both the technologies and the animals. I was so energized and inspired that I spent an entire weekend working on the covers without much sleep. At the end of the weekend, I gave several sketches to my neighbor to take into the office. Some of the people at O'Reilly were taken aback: they thought the animals were weird, ugly, and a bit scary. But Tim got it immediately—he liked the quirkiness of the animals, thought it would help to make the books stand out from other publishers' offerings—and it just felt right. And so it began. We’ve published hundreds of Animal books since then, and the brand is well known worldwide. Figure 2. Not a chimp. Chimpanzees don’t have tails. I once misread the caption on an engraving and mistakenly identified a monkey as a chimp. We got an avalanche of mail from readers informing us that chimpanzees absolutely do not have tails (our readers are all over this stuff). People will go to great lengths to avoid seeing certain animals. The husband of one reader complained about our use of a spider on—and in—Webmaster in a Nutshell. Spiders terrified his wife. He went through the entire book and put white tape over the graphic on the first page of every chapter so she wouldn't have to confront the spider. Another customer sent angry email telling us he'd never go to one of the pages on our website because it had a snake on it. It was our "How to Order" page. We replaced the snake with a rather pleasant-looking rabbit. People especially like animals that have faces. The images we use on the Animal books are from the entire animal kingdom, from large land mammals like tigers and elephants to fish, birds, insects, and invertebrates. Over the years, we've learned that many of our customers and authors gravitate to animals with recognizable faces, especially when they're looking directly at the viewer. Figure 3. Left to right: (Information Architecture) A perennial favorite: the "Polar Bear" book, with the world's friendliest-looking polar bear. (Designing for Sustainability) It's not just mammals and birds: the face of the jeweled lacerta lizard will also catch your eye. (R Packages) This New Zealand kaka is looking right at you. There are some incredibly beautiful engravings of animals that most people have never seen before. We have a large collection of original 19th century engravings, and the images, by and large, are both surprising and wonderful. Figure 4. Left to right: (WebSocket) An extraordinary engraving of a sea anemone. (BioBuilder) Behold the fantastic golf-tee medusa jellyfish. (Functional Thinking) A thick-tailed greater galago, also known as a bushbaby. The animals are in trouble. Doing research on the animals as O’Reilly cover designer Karen Montgomery and I work with the engravings has made us hyper-aware of the plight of wild animals worldwide. 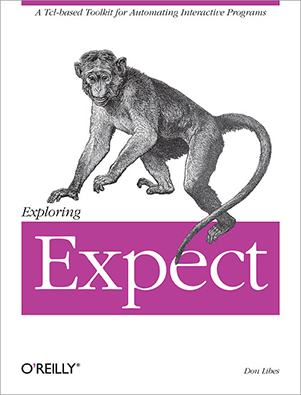 Many of the animals that appear on our covers are critically endangered—the tarsier from Learning the vi & Vim Editors, the lorises from sed & awk, the Hawksbill turtle from Getting Started with CouchDB, the tiger from Running Mac OS X Tiger, and the African elephant on Hadoop: The Definitive Guide, just to name a few. When most of the engravings were created in the 19th century, these animals were plentiful. Today, between habitat destruction, hunting, poaching, human/animal conflicts, and the illegal wildlife trade, many species that were abundant 100 years ago are teetering on the brink of extinction. We hope that by highlighting conservation projects large and small, from no-tech to high-tech, on the O'Reilly Animals website will not only raise awareness of what is already being done; perhaps it will also inspire smart, tech-savvy people like you to come up with new ways to save and protect the world's wild animals. For us, that's work that really matters. Article image: This illustration of slender lorises was used on the cover of one of O'Reilly's earliest animal books, sed & awk. (source: O'Reilly). Edie Freedman is the Creative Director at O'Reilly Media.